A potentially significant severe weather episode is unfolding for the forecast area later this afternoon well into this evening. The Storm Prediction Center has placed the entire forecast area in the Enhanced Risk category for severe weather. Please see the map below. The Enhanced Risk area is in orange, the Slight Risk are is in yellow, the Marginal Risk area is in dark green, the lighter green area means non-severe convection is possible. Setup: A powerful upper level trough will be digging into the western portions of the state. A dryline will setup ahead of this system and begin surging eastward. Copious moisture advection from the Gulf will be pulled northward, indicative of dewpoints surging into the upper 60s/70s. CAPE (convective available potential energy) values in this moisture laden, warm atmosphere will climb to around 3000 to 3500 J/Kg with shear in excess of 50 knots. What to Expect: Discrete cells should begin firing along and ahead of the dryline and possibly as far east as the I-35 corridor late this afternoon. These will rapidly become severe producing gigantic sized hail in the Enhanced Risk area. It will be possible for hail to reach baseball, or even softball, size in this type of environment. Over time these cells should grow into a QLCS (quasi-linear convective system) and push eastward with an attendant damaging straight-line wind threat. With the discrete supercells, especially ahead of the dryline, a few tornadoes cannot be ruled out. The tornado threat should wane as the storms form into QLCS. Another line of storms may approach the are later tonight along the actual cold front. When: Wednesday, April 17, 2019 between 5:00pm and Midnight. Please stay alert to changing weather conditions and heed any possible warnings that may be issued for your location. 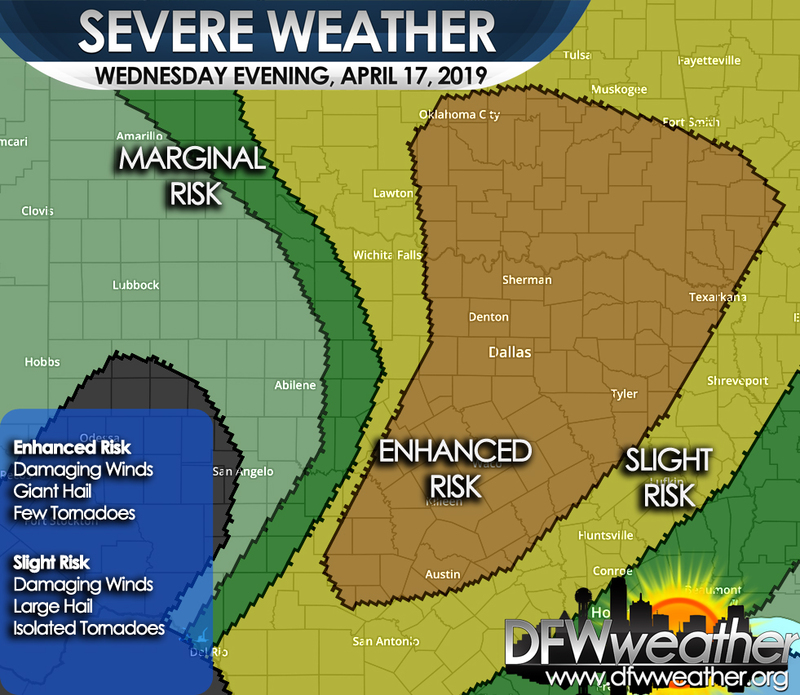 Storm Prediction Center severe weather outlook for Wednesday, April 17, 2019. Damaging winds, giant hail, and a few tornadoes are possible in the Enhanced Risk area which covers the entire forecast area. For reference, the average annual rainfall at DFW is 36.14 inches. DFW Airport officially reached the freezing mark for the first time this season (11/10/2018 – 32°F). This is the earliest first freeze on record since November 5, 1992 (31°F), 26 years ago. The average first freeze for a given cold season is about November 22nd. On November 14, 2014 (31°F) was the last earliest first freeze of recent record. A cold, modified Arctic airmass has surged into the DFW area today. A strong surface anti-cyclone pushing south will decouple winds this evening promoting dry and cold air advection into the region. This will set the stage for temperatures to plummet to the upper 20s and lower 30s by Saturday morning. DFW Weather is officially forecasting a low of 32°F at DFW Airport with temperatures north falling into possibly the upper 20s. The heart of Dallas and the Metroplex, along with areas South of I-20, may hang up in the 33°F to 35°F range. Currently, Wise, Collin, Denton, and Parker counties are under a Freeze Warning. Should DFW Airport fall to freezing tonight or Tuesday morning, it is still several days ahead of the average first freeze which is November 22nd, but not anything record breaking. The earliest first freeze on record is October 27, 1957 (29°F). However, it would be the earliest freeze since 2014 (November 12th – 31°F). An even stronger surge of Arctic air is expected to arrive Sunday night bringing with it a shot at rain and a cold, raw day on Monday. The latest data (as of Friday afternoon) is indicating that temperatures may not get out of the 30s on Monday with most everyone falling into the 20s by Tuesday morning. This will set the stage for possibly a hard, killing freeze (at or below 28°F). Some of the data indicates that the rain on Monday may become mixed with snow, especially north and west of the DFW Metroplex. For now, we are just forecasting a cold rain and will continue to evaluate the latest data. If the models continue to trend colder, then this could be a real possibility. Residents of DFW are reminded this is a good time to winterize your homes and cover, or move indoors, sensitive plants susceptible to the cold. Please stay alert to possible changes to the forecast over the coming days. Just a reminder that we fall back one hour at 2:00 am, Sunday, November 4, 2018. Central Daylight-Savings Time (CDT) ends and we begin Central Standard Time (CST). Remember to set your clocks back one hour. DFW set a new record low temperature of 41°F. The previous record was 42°F set in 1922. This is the first record low at DFW since July 2014. DFW also set a record low maximum temperature of 49°F. The previous record was 60°F set in 1923. This is the earliest ever recorded of a high temperature remaining below 50°F. The previous earliest record of temperatures this cold was October 22, 1936. DFW also set a daily record rainfall of 2.93 inches. The previous record was 1.93 inches set in 2007. The rain records were shattered with this past weekend’s rain event. On September 21, 2018, DFW picked up 5.85 inches of rain, just shy of the record of 6.38 inches of rain set in 1900 on that date. We picked up an additional 2.31 inches of rain on September 22, 2018 shattering the old record of 1.47 inches of rain set in 1914. The 24-hour period between 8pm and noon September 21-22, 2018 was the greatest 24-hour precipitation ever recorded for September at DFW with a torrential 8.16 inches. This breaks the old record of 7.74 inches set in 1932 for the month. This brings the month of September 2018 to a whopping 11.49 inches of accumulated rain. This shatters the old record of 10.82 inches of rain set in 1932 for the month of September. The average annual rainfall for September at DFW is 2.55 inches, thus we are well above normal for the month. Through the end of September, DFW should average 26.66 inches of rainfall for the year. We are currently sitting at 33.70 inches, a good 7 inches above normal for the year. We are just 3 inches shy of reaching our annual average rainfall of 36.16 inches. The record high of 106°F set in 1974 for yesterday, July 22nd was broken at DFW Airport. The high temperature recorded for yesterday was 109°F. Temperatures today will not be near as hot as they have been the last several days, but will still be hot. Expect temperatures to hover in the low 100s over the next week before a stronger cold front arrives next Sunday/Monday brining our temperatures back to more seasonal levels in the mid 90s (or possibly cooler, depending on cloud cover and rain chances). Normal high temperature for this time of year is 97°F. DFW Airport set another record high temperature yesterday, July 21, 2018. The high was 109°F breaking the old record of 107°F set in 2012. The record breaking heat wave continues today with forecasted high temperatures climbing as high as 108°F to 110°F once again which will easily break the record of 106°F set in 1974.